There is a nagging tape that runs in my head. If people knew the depths of evil inside you…if they knew what you struggle with, the dark thoughts that flit unwelcome through your brain…you would be an outcast. I have seen the depths of yuck inside me. I don’t want to admit it because on the outside I look like a good little Sunday school girl. OK, I’m not that young, but I am not someone on America’s Most Wanted and according to certain standards I appear pretty good. I haven’t committed murder, never abused a kid, I have only had one speeding ticket. But this revelation that I am the worst of sinners was never intended to drive me to despair. God intended it to drive me into the grip of grace. The grace that God gives us freely in the work Jesus did on the cross is not void because of the depths of our sin or evil. Instead our sinfulness only makes God’s grace even more amazing. Furthermore our sinfulness, our evil, our depravity does not disqualify us from God’s grace. God pours out His grace on those of us who look at ourselves and realize we can’t do it ourselves. We are not good enough, kind enough, peaceful enough, loving enough…We can’t be right before a holy and righteous God. But God, He made a way that we cannot mess up. Jesus did it for us. If He can save someone like me, He can save anyone. That is it. 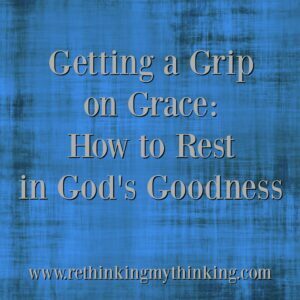 When we begin to grasp God’s grace, we cannot help but be overwhelmed by His goodness. Father God, I confess apart from You I can do nothing good. Nothing that could make my relationship with You right. I know I am hopelessly bound to sin without You. But…You are a God who loves me so much that You died so I could be forgiven and receive Your righteousness. Help me rest in Your goodness even when circumstances scare me. Help me trust You because if Your grace is that amazing, You have good things (even if those things are hard) planned for me. In Jesus’ Name I pray. Amen.